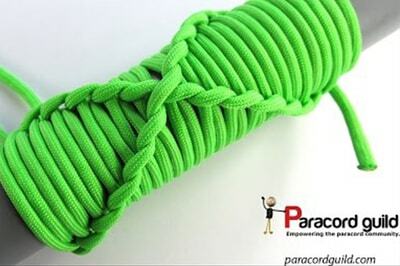 One of our most popular posts here at Paracord Planet is Wrap It: 5 Ways to Wrap a Handle with Paracord. To celebrate the arrival of our new coreless paracord, we thought it was time to give you a more complete list of ways that you can wrap things in paracord. 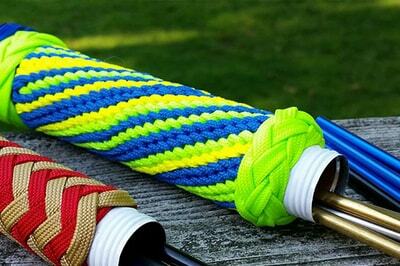 Though extremely popular now, rope handle wraps are not a new idea. Many of the weaves and knots listed here have been around since ancient times. They served many practical and decorative uses and still do—even in our high-tech world. If you are reading this, you probably already know what you want to wrap. If not, here are a few of the possibilities. 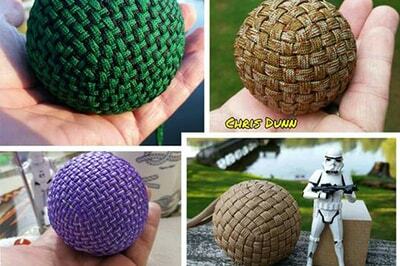 Things That Can Be Wrapped in Paracord. I have attempted to make this list as complete as possible and have done my best to include alternate names for each knot/weave in the descriptions. That being said, I'm sure I've missed some. Feel free to let me know in the comments if I have. Due to knots having more than one name, the wrapping methods are not ordered alphabetically. Instead they are grouped by concept and ordered by difficulty, starting with the easiest handle wraps. Press ctrl+f on your keyboard to search this post for a specific wrap listed. Some of the pictures used are from our amazing Facebook fans. Credit is given below each picture. 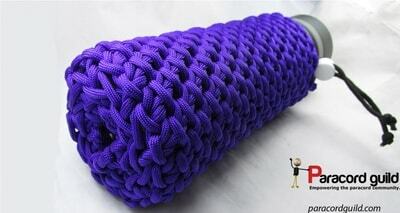 This method is merely a wrapping of rope around and around a handle. A special technique is used to secure your ends until you want to deploy your cord. Similar to a common whipping. Find instructions here. 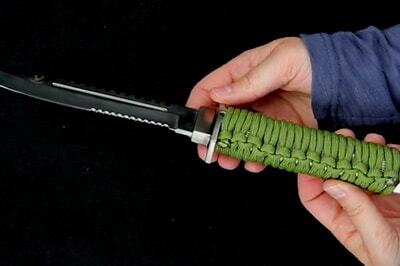 Very popular as a Japanese sword wrap, this method looks great on flat and ovular handles. There are a few ways to achieve this look. 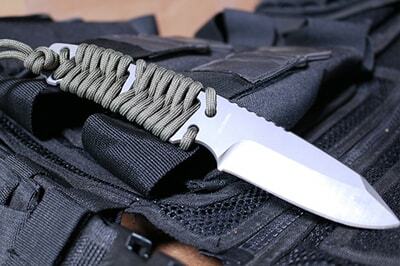 The most simple is to do a simple wrap with webbing or coreless paracord, except you twist the cord 180 degrees on every flat side of the handle. 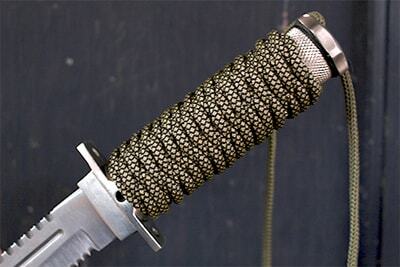 This wrap is great for survival knives that have holes in the handle. It�s a simple weave that gives a nice look. Also works with two colors. This one can hardly be considered a knot, but it makes a quick and excellent handle wrap just the same. Find out how to achieve this look here. This is, essentially, a bunch of overhand knots. Often used on the end of ropes to keep it from fraying. 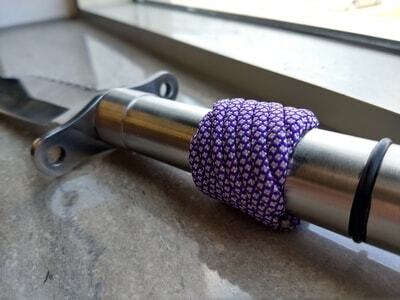 This wrap is a very quick and easy way to make a very nice handle wrap. 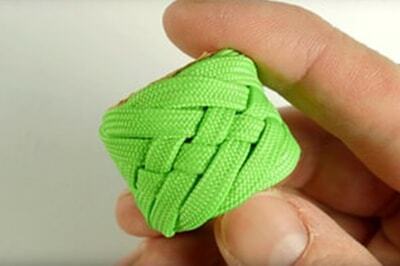 Make sure your knots are all tied the same direction to keep this wrap looking neat and even. We've got a photo and a video tutorial for this one. 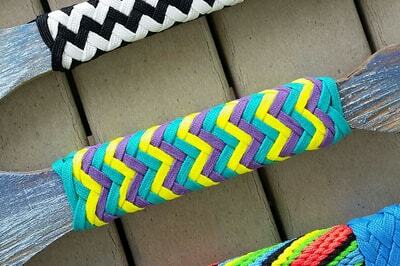 You probably knew this was the most popular bracelet weave, but did you know it could be used as a handle wrap? If you know how to make a cobra bracelet, you already know this one. 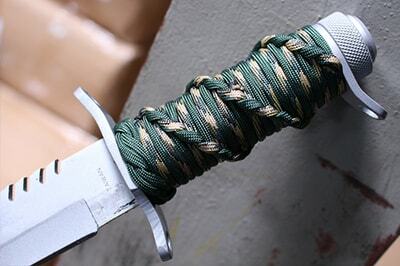 Instead of weaving it around paracord strands, just do the same thing around your handle. This wrap is best on flat handles, but will work on round too. 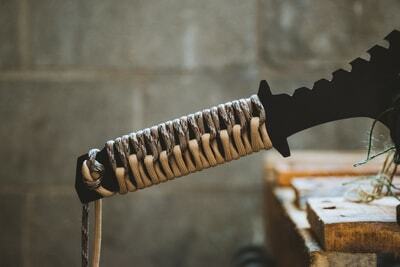 For a different look/grip you can orient the knotting on either the ridge or the flat side of the handle. Learn how to make the one in the picture with this video tutorial. Believe it or not, this is just like the cobra weave, except you start the knot from the same side every time instead of alternating like for the cobra. This wrap is great for large diameter round handles such as canoe paddles. 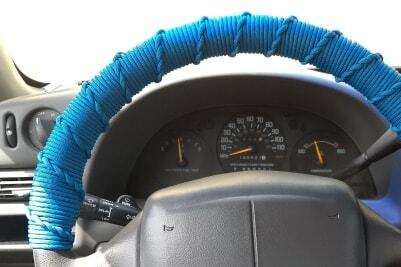 Similar to both the cobra and the DNA, this one has a single spiral ridge that would look also look great on a canoe paddle or steering wheel. It involves making one overhand knot per pass around you handle. Tutorial can be found here. 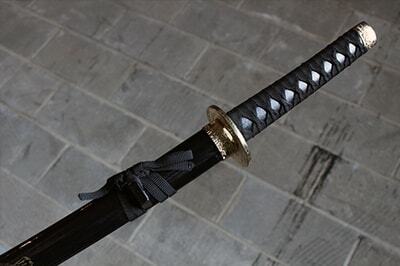 A little more difficult than French Hitching, the Moku has intersecting diagonal ridges. A cool look for sure! Yet another similar hitching, St. Mary's has a wider ridge that looks good with two or more colors. Another very simple handle wrap. This one creates a single ridge running down the side. If you want instructions, check out this video. This version of the ringbolt has a distinct double ridge running down one side. Similar in technique to the standard ringbolt, this hitch wrap has its own unique look. Works well with multiple colors. This is a weave in the traditional sense. Over under, over under. The one pictured is a slight modification of that pattern. This is similar to a grafting weave, but instead of over under, you loop the vertical strands over and around the perpendiculars. This is again the same idea as grafting, but instead of two strands at a right angle, this one uses three directions of intersecting strands. The result is an amazing 3D look that people won't believe is hand made. (top left) Can you say Q-Bert? Many different varieties of this weave create different patterns such as a star triaxial. (top right and middle)You'll probably want to use coreless paracord for these. 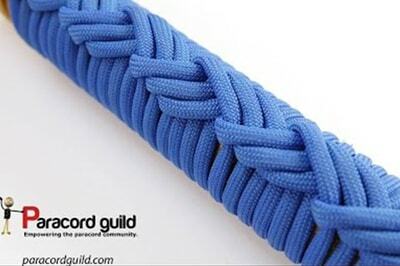 This multi-functional knot has many different variations for making anything from bracelets to pot holders. 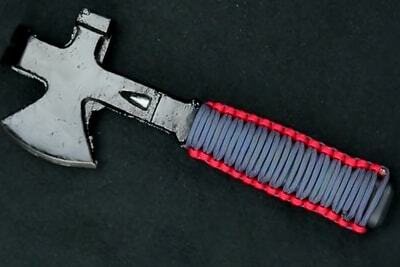 It is often used in conjunction with other handle wraps to cover the stray ends of a different weave. 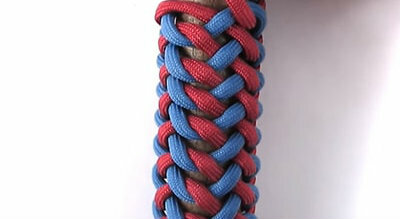 (paddle on far right) Many varieties of this knot exist that will give your handle very different looks, as can be seen in the picture. The next few wraps are versions of the Turk's head—or at least near cousins. Not to be confused with the mustached Marx brother, this one is knot for the faint of heart. If you have the motivation and the patience, however, it will pay off. Oh, the ever-popular pineapple turk's head. This one is best made with coreless paracord as well. Technically a form of a turk's head, this knot has a nice even wavy appearance. Looks very nice with two or more colors. This tight knot is nice and thick. 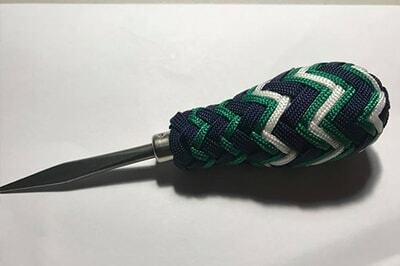 Another option for finishing off the ends of your handle wrap. Looks good with coreless paracord. 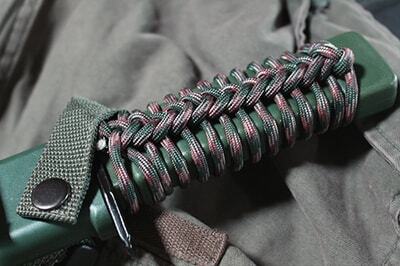 Paracord Guild strikes again with this good tutorial. 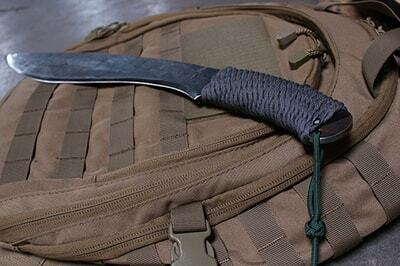 Not often used as a handle wrap, this knot has a nice finished look that is hard to beat. A great way to finish off the end of your wrapped handle. Often used as a tangle-free method to store thick rope or power cords, rows of this knot can be linked together, making a good wrap for wide-diameter objects, such as a water bottle. This method is very similar in concept to crocheting. This wrap is quick deploy.You can also wrap each pass of the knot around your handle for a drastically different look that looks more like hitching. 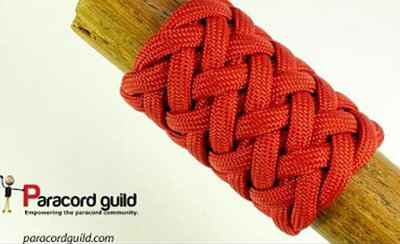 Another Paracord Guild tutorial. This handle wrap has a distinct bumpy texture that gives a firm grip to round handles. Instructions here. 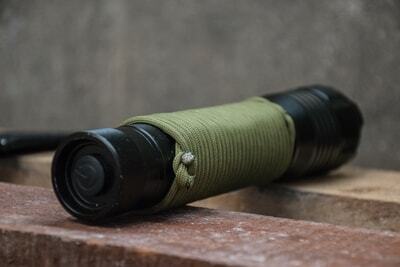 This complicated wrap looks especially amazing with a small diameter rope or paracord. You will probably want a turks head knot on the end to finish this one off. Be prepared for your fingers to be numb. A tight wrap requires a lot of rope-pulling. Youtube instructions for the pictured one here. While these wraps can be adapted to many applications, some of them are better suited for either round or flat handles. The pictures should give you a pretty good idea of which are which. With any of these wraps, tightening as you go is important. However, if you used paracord and get to the end of your wrap and it is still a little loose, soak the handle in warm water for a few seconds to shrink the paracord and tighten the weave. 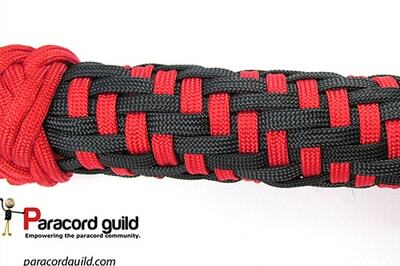 Did I mention that you can now find coreless paracord in our store? 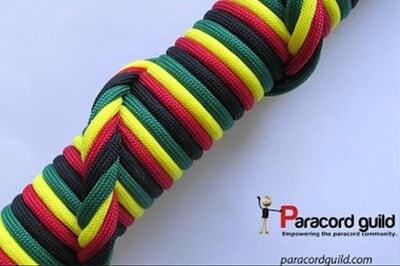 Here is our current list of paracord colors and sizes. Be sure to check back as we are frequently adding more! 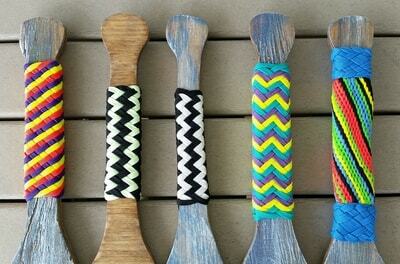 Am I missing any handle wrap varieties? We would love to hear about any others that you have seen or used! Maybe these will be covered in a future post. 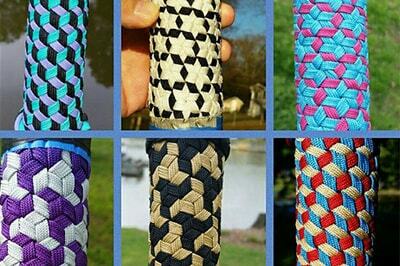 Get paracord crafting tutorials and inspiration straight to your inbox. Subscribe to our newsletter at the bottom of this page! We use Disqus as our commenting client. If you are on the fence about creating an account, let me explain what it can do for you. Disqus is one of the most used comment clients on the internet, used by thousands of websites. Having an account, or linking a social account, will allow you to be notified when someone replies on a post you have commented on. 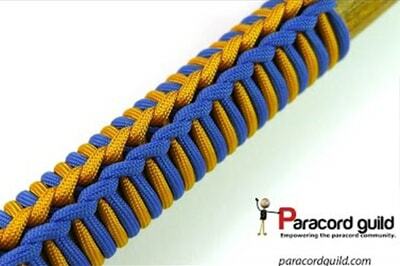 It's a great way to join the Paracord Planet community, as well as many others!